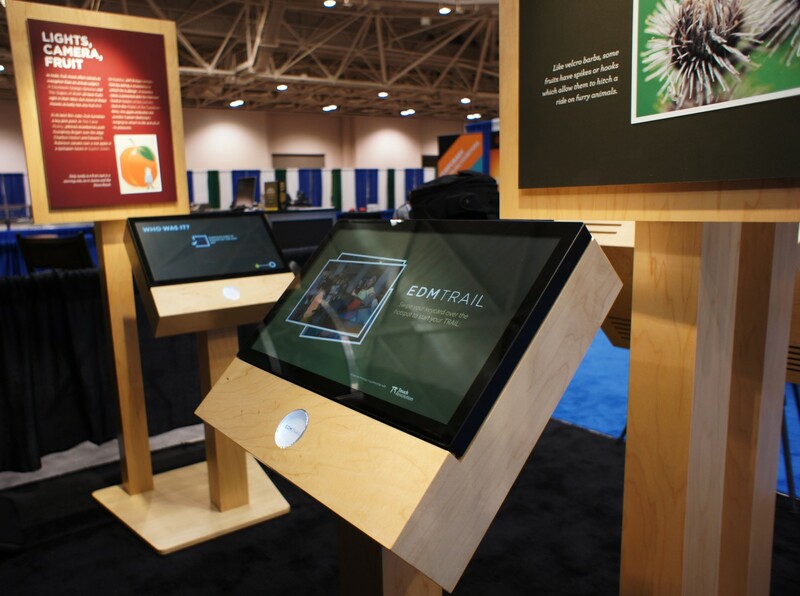 For this year’s Expo in Minneapolis, we decided to focus solely on promoting TRAIL, our smart-card-based system for engaging students with a museum’s physical stories, images/paintings and artifacts. Rather than handing out brochures and giving demos, we wanted conference attendees to actually experience TRAIL for themselves, so we created a whimsical “Museum of Fruit” on the Expo floor. With museum-quality cabinetry, carefully researched graphic panels interpreting fruit within the context of art, history, popular culture, etc., and even a vitrine-enclosed Carmen Miranda doll, we set about authoring TRAIL activities for deployment on 6 touchscreen kiosks. Over the course of the 3-day expo, several hundred passers-by accepted the (admittedly) bizarre challenge of “would you be willing to go on a short interactive TRAIL through our imaginary “Museum of Fruit”?” Provided with an RFID card and instructed simply to “start at any station by swiping your card at the hotspot”, visitors were off, quickly engrossed in screen activities that had them looking closely at the Museum of Fruit’s graphic panels and artifacts. Part of what makes TRAIL successful is its ability to coordinate the trouble-free movement of many students throughout an exhibition. Not in lock-step, mind you, but at a pace determined by the students themselves. A tremendous amount of work has gone into the development of this navigational aspect of TRAIL. There’s a definite “aha” moment when, having been tasked with leaving one touchscreen in search of another location in the museum, you arrive to find the station reserved for the continuation of your TRAIL. In planning for Expo, we quickly realized that conveying this navigational aspect of TRAIL within the confines of a single 10’x10′ trade-show booth would be impossible. So EDM set up two booths, separated an aisle apart and just out-of-sight from one another. As with the real TRAIL, visitors were initially tasked with moving short distances, from one kiosk to another in the same booth. Then, we’d challenge them to move further, to a station in the other booth an aisle away. Almost everyone paused at this request. Some would ask, “Really, it wants me to leave your booth and go around the corner?” We’d nod and the visitor, armed only with a blue TRAIL RFID card, would walk away. Turning the corner, seeing a second booth, approaching and finding a screen waiting for their arrival put a smile on each and every visitor’s face. This was the “aha” moment we wanted our potential clients to experience, the initially uncomfortable feeling of launching oneself away from one screen, followed by the satisfaction of successfully navigating to another screen in a different part of the gallery. We see this every day with our visitors, and in all honesty it still amazes us. Having experienced TRAIL for themselves — and keep in mind that EDM staff had simply handed out a card with minimal instruction — visitors had all kinds of questions. “Can TRAIL be used for regular museum visitors?” Yes. “Could we use this system outdoors?” Yes. “Can we tweak the content?” Yes, you have full control over the content using our template-driven content authoring system. It was very rewarding to hear visitors excitedly brainstorm on how TRAIL could be tailored for use in their respective institutions. Thanks to everyone who stopped by. We look forward to seeing you at AAM Expo 2013 in Baltimore.